By contrast, I know without any doubt whatsoever that if I had never blogged at all I would not only not have the same job I have now, I would not have gotten my previous job, and might very likely not have gotten promoted at the one before that. The blog was not just the venue in which I started putting together the ideas that became my second book, the one that made promotion and various subsequent jobs possible, but it was also the way that I was able to demonstrate that there might be a readership for that second book, without which it’s much less likely that a press would have been interested. And then, of course, there’s that blog-based open review project, which was crucial to the book turning out to be the book that it was. Scholars will cite a dozen mediocre peer-reviewed published papers before they’ll cite even the most brilliant blog post. — triggers in me an unfortunate case of #NotAllScholars!, which while perhaps literally true is just as unhelpful and privileged and key-issue-avoiding as all other versions of #NotAllX are. In fact blog posts are not the kind of thing one can detail on one’s annual review form, and even a blog in the aggregate doesn’t have a place in which it’s easy to be claimed as a site of ongoing scholarly productivity. Alan, in any case, is working his way around to what the blog might actually do, regardless of what our shared profession thinks it might or might not do. And in a somewhat different way, I am as well. As I noted in an aside, I’ve never started a book project — and I mean that all the way back to my dissertation — in the way that I have always thought I was supposed to: (a) Having an Idea; (b) Researching that Idea; (c) Outlining the Book exploring that Idea; (d) Writing the Book detailing that Idea. Mine have gone more like (1) having some vague annoying idea with a small i; (b) writing multiple blog posts thinking about things related to that idea; (iii) giving a talk somewhere fulminating about some other thing entirely; (4) wondering if maybe there are connections among those things; (e) holy carp, if I lay the things I’ve been noodling about over the last year and a half out in this fashion, it could be argued that I am in the middle of writing a book! This is in my experience less a matter of, as Alan describes it, an idea pulling up in your driveway and sitting out there honking its horn, than it is me waking up in the driver’s seat on the freeway and thinking that maybe it would be a good idea to put my hands on the wheel after all. All of which is to say: it hit me this afternoon that there’s an idea — small i; vague; annoying — that I’ve been writing and talking about in a weird range of forms lately (talks, blog posts, grant proposals). And today I’m wondering whether that might be the next car I wake up in, and whether there’s a way for me to prepare to take the wheel. 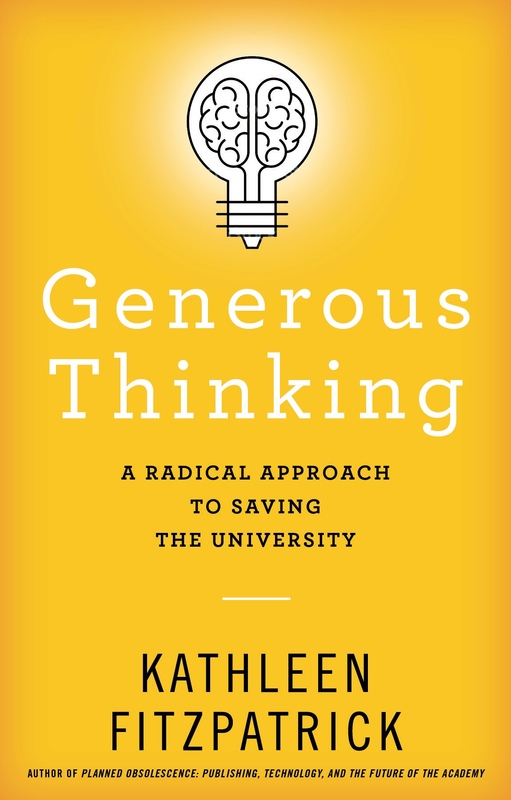 Yesterday, I wrapped up the revisions on Generous Thinking, and I’m finding myself of very mixed minds about where I am today. On the one hand, I am super excited about getting the manuscript into the press’s hands, getting it moving through the process toward the next stage of its public life. The events of the last few weeks — at both the national and the institutional level — have me convinced that this project needs to be out there now. On the other hand, I have the not-so-vague feeling that I have been running as hard as I can toward the edge of a cliff, and that one morning soon, having sent off the manuscript, I’ll look down and discover there’s nothing beneath my feet. So I’m finding myself drawn to doing bit of preemptive thinking about what’s next, hoping that the gap between the ground I’m currently running on and the next bit of ground ahead might be less wide and less deep, leading to a less painful crash. Don’t get me wrong, I know a fair bit of what’s ahead: reviewing copyedits, indexing, and all the other many things that still have to be done on my side of the process of transforming that manuscript into a finished book. But I have never completed a major project knowing what my next project was going to be. Or — maybe this is closer to the truth — I have concluded major projects thinking I knew what the next project was going to be, but I have always, always been wrong. And it’s taken longer than I expected, every time, to find my way into another project. So on the one hand, I know that I’m in for a bit of flailing. On the other, I’m trying to give myself as much of a path forward as I can, so that maybe I can avoid the worst of it. This time out, that path consists of a lot of reading, piles of books that I’ve stacked up over the last few months, that I’ve been looking forward to getting into. I think the key challenge is going to be letting myself explore, letting myself not-know exactly what it is I’m reading for. And probably letting myself do a bit more thinking-out-loud here. In any case: manuscript out. And more, of some as-yet undetermined sort, to come. After yesterday’s search for the source of Simone Weil’s oft-quoted “Attention is the rarest and purest form of generosity” went a bit Lot-49ish on me, I wondered whether I should just have been satisfied with that “attributed to.” But I’m glad I didn’t let it go, for a couple of reasons. J’ai été très touchée de constater que vous aviez fait véritablement attention aux quelques pages que je vous ai montrées. Je n’en conclus pas qu’elles méritent de l’attention. Je regarde cette attention comme un don gratuit et généreux de votre part. L’attention est la forme la plus rare et la plus pure de la générosité. I was touched to see that you had truly paid attention to some pages that I showed you. I did not take from that that they deserved attention. I regard that attention as a gift freely and generously given on your part. Attention is the rarest and purest form of generosity. Being closely read, and receiving careful feedback, may in turn be the rarest and purest form of attention. I owe the readers of Generous Thinking more than I can say. I am returning, at last, to the thoughts I was exploring in my recent posts on Miranda Joseph’s Against the Romance of Community (post 1 | post 2), and I’m starting to wrestle this morning with the big one: obligation. Thinking about community as a strategic rather than an idealized concept, community in its pragmatic coalition-building sense, leads me to consider the work required to create and sustain communities. If the kinds of communities that I am seeking in trying to imagine a more generous relationship not only between the university and the publics that it engages but also, crucially, within the university itself are first and foremost voluntary communities—self-organizing, self-governing collectives based in affiliation and solidarity—what exactly can we be said to owe those communities? Do those communities and our relationships to them impose obligations on us? This question about obligation came up early on in the review process for Generous Thinking. For some readers, my suggestion that “we” (meaning, in this case, those of us involved in and committed to the life of the university) have obligations to one another and to the world evoked a sense of noblesse oblige, a condescending assumption that we bear gifts that we must bestow upon the less fortunate around us. For others, the notion of obligation seemed to erode the idea of generosity itself, undermining individual commitment with a sense of requirement. Several commenters wanted me to replace the term, but I remain convinced that it’s the right one, though I’m still working on explaining why. Obligation as I intend it is not connected, except etymologically, to noblesse oblige. In fact, I’d argue that noblesse oblige is a particularly self-aggrandizing form of voluntarism: we may feel that we have to give to those in need because of our station or privilege, but that “have to” is one we can easily walk away from; the commitment is entirely self-selected. The obligation that I’m focused on, that I hope that we can consider in the context of generosity, is one of which we cannot absolve ourselves. As Francois Lachance pointed out in the discussion, “obligation” derives from the Latin obligare, “from ob- ‘towards’ + ligare ‘to bind’.” That is the sense of obligation that I want to explore: that which binds us together, that which we cannot walk away from without doing grave damage both to ourselves and to the fabric of the whole. That isn’t to say that we don’t have choice, as members of voluntary communities, about whether to fulfill those obligations, or that there isn’t agency in the kinds of generosity I’m hoping to foster. But I remain convinced that we do bear actual obligations toward one another deriving from our common presence in a space, an institution, a community. We owe one another recognition as members of that community. We owe one another attention to the concerns we bring to that community. These two strands, for Appiah, exist in an ongoing tension: we bear obligations that bind us together; we take seriously the differences that mean we must be allowed to go our own way. That individual, agential freedom does not relieve us of our shared obligations, but nor does the nature of our obligations eliminate the agency that all of us bear in our own lives. This tension also appeared in my notes in Lewis Hyde’s consideration of the debts that participation in a gift economy creates. Hyde cites Marcel Mauss on the “three related obligations” that mark gift economies: “the obligation to give, the obligation to accept, and the obligation to reciprocate” (xxi). Hyde winds up at moments treating the notion of obligation in a fashion much closer to the reading of my commenters—as a requirement that a gift imposes upon us, an imposition that we attempt to remove by passing on—but it’s also a relation that sustains the entirety of a community. There is, I think, something important to consider in this connection between obligation and the gift, especially if we are to seek alternatives to the neoliberal economies in which our institutional and personal lives are otherwise embedded. Most compelling for me, however, is the use that Bill Readings makes of obligation in The University in Ruins. In attempting to define a path out of the morass that the University of Excellence has landed us in, Readings turns repeatedly to the notion of obligation and its connection to community. His goal, he notes, is “an anti-modernist rephrasing of teaching and learning as sites of obligation, as loci of ethical practices, rather than as means for the transmission of scientific knowledge. Teaching thus becomes answerable to the question of justice, rather than to the criteria of truth” (154). That connection among obligation, ethics, and justice leads to his commitment to dissensus and his sense that “the condition of pedagogical practice is, in Blanchot’s words, ‘an infinite attention to the other’” (161), an ethical obligation that cannot be discharged. And an obligation whose infinitude is created in no small part by our being-in-community; “the obligation of community,” he notes, is “one to which we are answerable but to which we cannot supply an answer” (187). If we are going to build and sustain communities, then—not romanticized communities, but rather communities based in solidarity, communities based on non-market relations of care—we need to be able to think about our obligations to one another, about our relationships to our voluntary communities beyond voluntarism. Coming full-circle to Joseph: her association of community with the structure of the non-profit, which deploys private philanthropy as a replacement for public commitment to the common good, underscores not only the voluntarism at the heart of noblesse oblige but also the political and economic sources of it: I am generous with what I have—I choose to be generous with what I have—precisely because we are no longer committed to one another as members of a shared social structure. Instead, the shift of responsibility for the public welfare toward private entities displaces our obligations to one another in favor of individual liberties and, I think, leaves us queasy about the notion of obligation altogether. What I’m trying to explore in considering generosity as a potential ground for rebuilding the relationship between the university and the public good, then, is in part the force of the commitments that we make to one another, but commitments that are based in an ethical obligation that endures beyond and outside individual agency. It’s a commitment that we must continually make the choice to renew, but an obligation that persists regardless of our choice. I’m still wrestling with all of this as I revise the manuscript, but the notions of community, solidarity, and commitment to the public good with which I’m working seem defined by the unresolved tensions in the relationship between generosity and obligation. As Readings says, we are left “with an obligation to explore our obligations without believing that we will come to the end of them” (190). This is where I’m trying to linger. I’d love to hear your thoughts. And then there are the mornings when I can spend two hours trying to untangle the logic in a single paragraph. I’ll grant that the thing I’m trying to say isn’t, and shouldn’t be, simple. And the paragraph is one of the keys to explaining why this chapter is in the book at all, so it’s important to get it right. But I didn’t expect it to be quite that hard to say. And the difficulty makes me wonder whether I’ve really gotten it straightened out at all. Leaving this here, in any case, to remind me to be a bit humble in this process. I have found few things quite as difficult as writing with clarity. Every so often you come across That Book, the exact thing you need to read, and a lot of the time it’s something that you might not have run into before and that you certainly had no idea you needed to read, and probably wouldn’t have except that more than one person pointed you toward it, and then it’s so much the thing you needed that you kick yourself for not having found it sooner yourself. Anyhow: Anne Gere’s Intimate Practices: Literacy and Cultural Work in U.S. Women’s Clubs, 1880-1920 is this week’s That Book. And I’m more than a little bruised from all the self-kicking I’ve been doing. I might be willing to forgive myself, if the title turned up in my previous research, for assuming that it was a history of turn of the century women’s clubs, and thus that it didn’t have much to tell me about my own current project — but a slightly deeper glance might have given me a hint that there was something I needed here. The book focuses on those clubs’ reading and writing practices at the heart of their self-formation and their public and private work. Even more, her chapter on “(un)professional reading and writing” makes a compelling argument about the ways that scholars of literature came to professionalize in no small part in opposition to the models of reading and writing embraced by clubwomen. This bit of the narrative of how we got to be the way we are is exactly what I’ve been missing, so completely at the heart of the argument I’ve been trying to make (about the dominant role that competition plays in today’s university structures, and the ways that a more generous engagement with the “common reader” might help promote a recommitment of our institutions to the public good) that I’m both overjoyed to have found it and mortified not to have found it sooner. This is why I wish I had time enough to stop and read all the things. That Intimate Practices is That Book, if it hadn’t already become clear, would have been made glaringly obvious when I ran into one uncanny bit of overlap. In a section that I’ve entitled “Why Do Readers Read?”, I note that dismissing pleasure in reading (whether as illicit, or unserious, or whathaveyou) opens space for anxiety to become one’s dominant reading affect, and particularly “anxiety about whether we’re reading the right stuff, or reading for the right reasons, or reading in the right way.” Gere, for her part, describes professionalized scholars of English, claiming for themselves a role as arbiters of taste, as having the effect of “making nonprofessionals fearful they were reading the wrong books or reading them in the wrong ways” (217). I’ve scoured my notes, as well as the texts I previously cited around that spot, to be sure that I didn’t somehow pick Gere’s phrasing up at second hand, but I’ve found nothing. So I’m taking this coincidence as a sign of deep connection, if an unknowing one, and I’m working on how I might build on it, what the rest of my argument might still have to learn. As I noted in my last post, I recently read Miranda Joseph’s Against the Romance of Community as a means of thinking a bit more deeply about the ways that Generous Thinking deploys the notion of community. As Joseph’s analysis suggests, the concept is often used as a placeholder for something that is outside the dominant structures of contemporary public life, a subcultural relation that harkens back1 to a mythical premodern moment in which people lived and worked in more direct connection with one another, without the mediating forces of modern capitalist institutions. It’s also often an imagined relation, in Benedict Anderson’s sense, as the invocation of “community” is designed to yoke together groups whose singularity is largely constructed, “the gay community” being Joseph’s primary referent. Calls to work on behalf of the community or to the community’s values wind up not only, as I noted in my last post, ignoring community’s supplementary role with respect to capital but also essentializing a highly complex and intersectional set of social relations. And it’s that last that got me wondering, first, whether a key part of the problem with “the community” might be less “community” than “the” — whether acknowledging and foregrounding the multiple and multiplicitous communities with which we interact might help us avoid the exclusions that the declaration of groupness is often designed to produce, the us that inevitably suggests a them. And second, whether the model of identity politics might lead us to a community politics that can similarly deploy a strategic essentialism in thinking about community, a recognition that our definitions of whatever community we’re discussing are always reductive, but also at least potentially useful as an organizing tool. Can we develop a strategic sense of community that is based not on a dangerous, mythical notion of unity, but rather around solidarity, around coalition-building? It’s the pragmatic, organizing, coalition-building function of community, or communities, that I’m most interested in, both in thinking about identifying the publics with which the university might work and in thinking about the structure of the university itself. As I discussed in my last post, Joseph compellingly analyzes the function of the non-profit organization, an entity very often associated with community in the underconsidered sense she critiques. Under late capital, the non-profit has been asked to take over the space of providing for community needs or supporting community interests that had formerly been occupied by the state as the entity responsible for the public welfare. The impact of that transition on higher education has been enormous: state universities, which had long functioned as state institutions in the most literal sense, have themselves been privatized, transformed almost wholly into non-profit organizations. So what might be possible if instead of allowing institutions of higher education to be understood as giant nonprofits, required to spend an enormous amount of time and energy on fundraising, we were instead to adopt a strategic sense of “community” as the basis for their structure? Are there particular forms of voluntary community — the labor union, for instance — that might provide models for the development of self-governing, activated collectives that are directly responsive to member needs? Would a deployment of community in this sense, always recognizing its complexity, help commit us to a sense of the common good? And — the $64,000 question — what would it take for us to actually get there? Yesterday morning, I closed comments on the open review of Generous Thinking. I’m enormously grateful to everyone who took the time to read and give me feedback on the project: 30 commenters left a total of 354 comments (and prompted 56 responses of my own). I have a good bit of insight into what’s working well and what needs improvement in the manuscript, and I’m excited about the possibilities ahead as I embark on the revision process. Getting started on revising a piece of writing is always daunting for me. The draft feels complete, and it usually holds together and works as a thing, if imperfectly, and the beginning of the revision process almost always involves breaking that completeness, that thingness, in order to open it up and rethink how it works. I resist initially, not so much because I don’t think the thing could be better but because I worry that breaking it open will wind up making things worse, that I won’t be able to do the hard transformational work of putting it back together in a new way. That initial leap, hard as it is, almost always pays off; once I get into the revision process I usually find myself excited by the patterns that I couldn’t see before, the new ways that ideas can be drawn together. But it’s still a leap, one that requires a deep breath (and a good cup of coffee) before diving in. Thanks to everyone, again, who read and commented and linked to the draft. The discussion will remain up and available, if you’re curious about how it went, and the general comments remain open if you have further thoughts I should take into consideration. I’ll look forward to sharing some of my thoughts from the revision process as things proceed.